1954 -- Bachelor of Arts; Smith College, Northampton, MA. 1991 -- Rochester Art Center, Rochester, MN. 2001 -- Corporate and Museum Frame, Richmond, VA.
1991 -- Textile Arts International, Minneapolis, MN. "Piles of Pile." 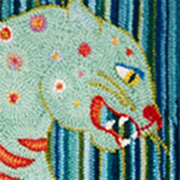 1990 -- Textile Arts International, Minneapolis, MN. "Needlework: A Stitch in Time." 1985 -- First Woman's Bank, New York, NY. "Rughooking." 1998-2000 -- Mecox Gardens, Southampton, NY. 1997-2000 -- Parks Duffey Gallery, Richmond, VA.
1992-2000 -- Stevens and Conron Gallery, Lenox, MA. 1983-2000 -- Wingspread Gallery, Northeast Harbor, ME. 1985-1992 -- Nantucket Looms, Nantucket, MA. 1986-1989 -- Diane Brott Gallery, Camden, ME. Stephen Mallory Asssociates, Inc., New York City for Kips Bay Decorator Show House. Parish-Hadley Associates, Inc., New York City. Jan-Feb 1992 -- Fiberarts Magazine. August 1991 -- Rug News Magazine. September 1990 -- Pacific Design Center, Perspectives Magazine.